Spring race season is in full swing. I had eight runners race this weekend and their hard work and accomplishments make me both proud of them and so excited to race myself in just four weeks. There’s something inspiring and almost infectious about the success of others in running. Meanwhile, training continues to be downright fun. I’m finding a lot of joy in the process of pushing myself, both in my runs and in strength training. Last week’s workouts struck a good balance of training: I had hard days, easy days, flat runs, hilly runs, strength training, and rest. As the race approaches, my hard days emphasize half marathon and 10K pace more and more. After a little bit too much food and drink on Sunday, I opted for a shorter easy run. 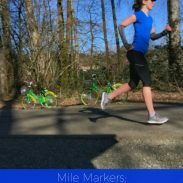 I took Ollie along for company and we cruised along for 5 comfortable miles. Our first two were around a 9:20 and then we naturally sped up as we warmed up and finished at an 8:35. The weather was beautiful – crisp temperatures and clear blue skies! I originally intended to strength train, but I moved my workout to later in the week. During these peak weeks, I want to at least get to the gym once to lift and do Pilates at least once per week. I thought the Easter food hangover would be over by Tuesday, but not when you enjoy the leftover cinnamon rolls and far too many Cadbury mini eggs on Easter Monday. My laparoscopy in December drastically reduced the frequency of GI issues, but too much sugar and rich food can still upset my stomach. I could feel a threatening cramp in my lower GI during the warm-up, so I gave myself permission to bail or modify the workout as needed. 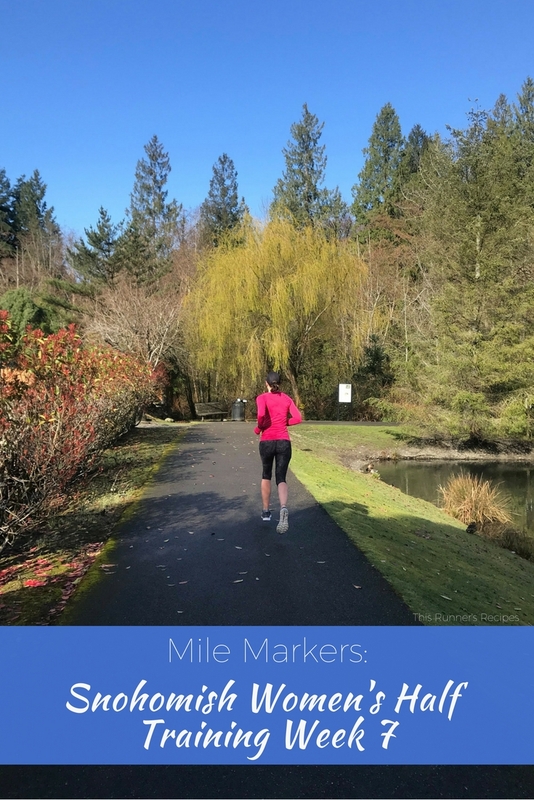 My intended run was 3 x 2 miles, with the first mile of each repeat at half marathon pace and the second at 10K pace, but I quickly modified it to the first mile at half marathon pace and the second mile slightly faster. My repeats clocked in at 7:16, 7:00; 7:16, 7:03, and 7:14, 7:07. Despite this workout not going as well as hoped, I’m pretty pleased to see those paces! I split the run between the dogs: I ran 3.5 miles with Charlie, quickly switched dogs, then ran 3.5 miles with Ollie. I was pleasantly surprised that Charlie held an 8:59/mile average pace – he was cruising for his little puggle legs on this run! Meanwhile, I had to hold Ollie back so we maintained an easy effort. Ollie kept looking up to the sky, seeing a duck or goose fly by, and then try to speed up. Does giving a puggle a bath count as a workout? This long run went surprisingly well. I started earlier than I’m used to, and it was really nice to finish a long run by 8:45 AM! My route was hilly – approximately 600 feet elevation gain. 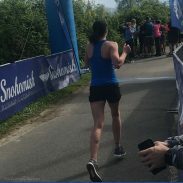 I focused on effort, keeping it comfortable through mile 10 and then progressing from marathon pace to half marathon pace: 7:50, 7:47, 7:23, and 7:19. 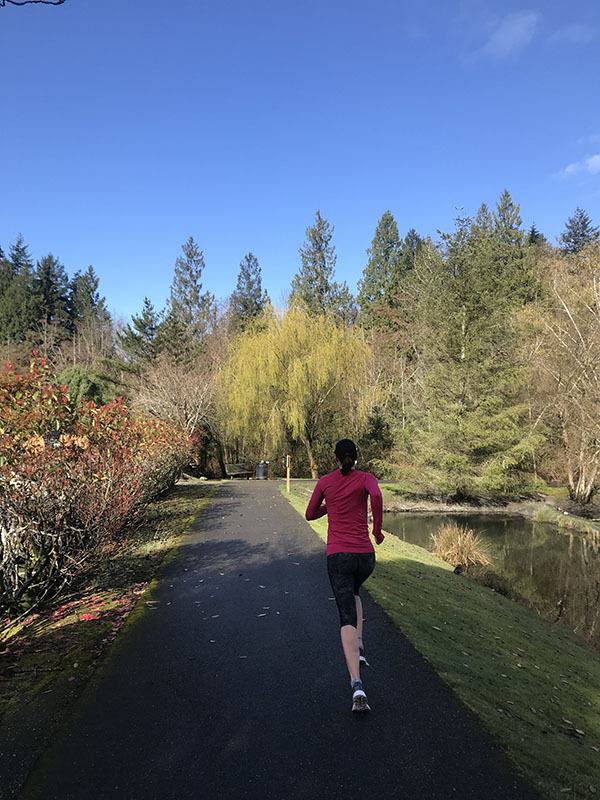 The weather was pleasantly warm – 50 degrees on this run! 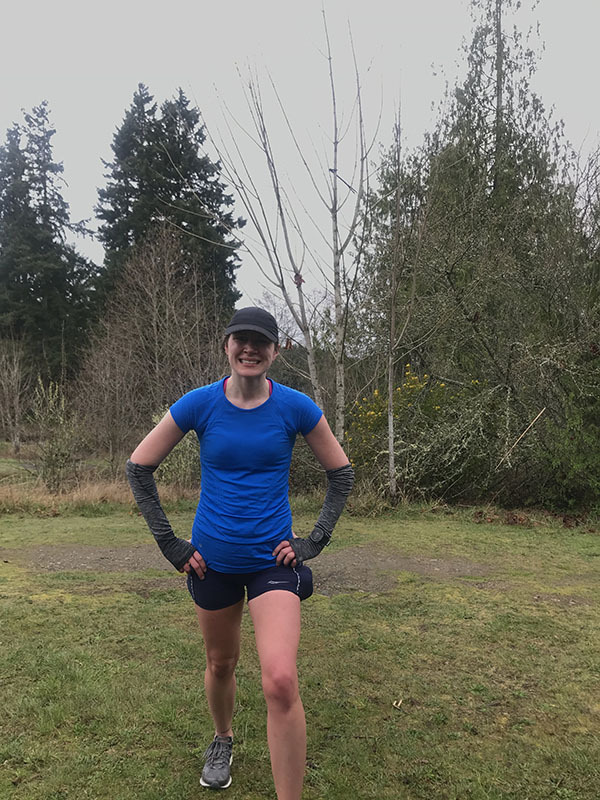 This entire training cycle I have been using Nuun Performance and Honey Stinger waffles (the gluten-free ones since they are less crumbly) on my long runs. I don’t think I can go back to using gels except maybe at the end of a race. My stomach feels better during the run and I actually have an appetite after my long runs, rather than a sensation of a sugar-bomb in my stomach. It was pouring rain when Ryan and I got ready to run, so we opted for the treadmills. We both wanted to strength train after the run and there was no chance of us actually strength training after a rainy run. Naturally, it stopped rainy within a few minutes of starting on the treadmill, but I was already on the treadmill so I just stuck with it. After hilly long run, flat terrain felt appropriate for a recovery effort. After the run, I did a 20 minute Pilatesology workout. We are in the odd transition period between ski season and hiking season. Instead of opting outside, Ryan and I hit the gym for strength training. 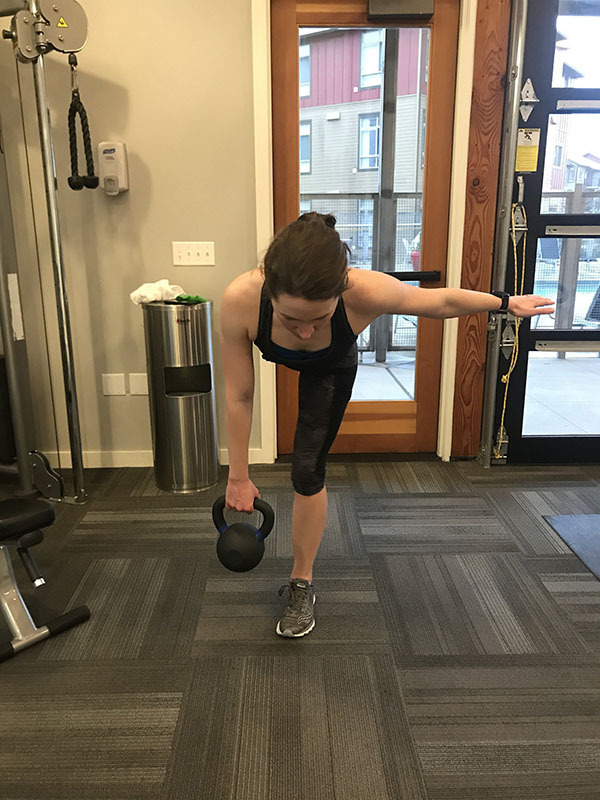 I did a similar workout to the one earlier this week: modified pull-ups, kettlebell exercises, and mini band exercises. Afterward, I whipped up a delicious batch of sourdough waffles for us. 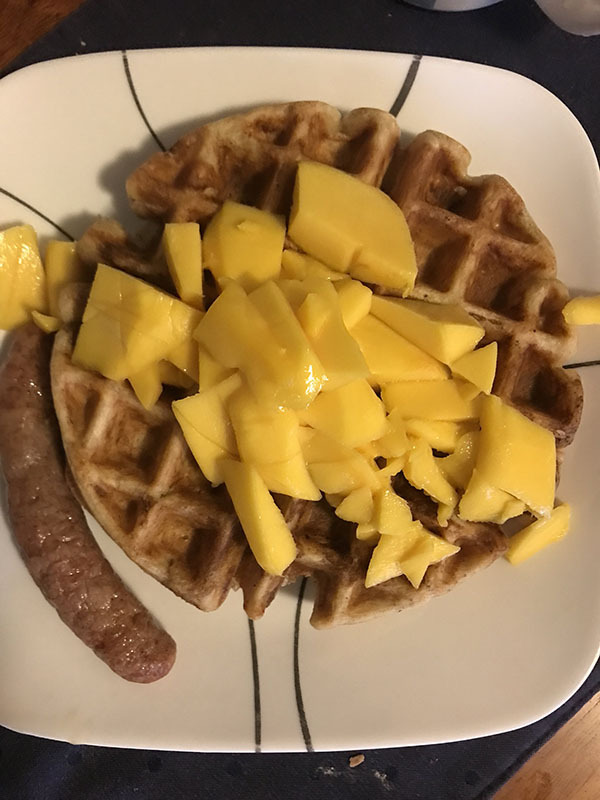 I’ve been craving fruit like crazy this training cycle, so I topped mine with mango. What foods are you craving right now? 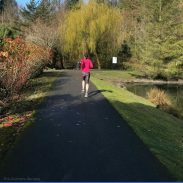 How was your week in running? Did you race this weekend? Race season is in full swing! I volunteered and helped pace a friend this weekend. I’m still recovering from a cold so running super fast had zero interest to me. Although once I got to the race, I felt a pull to go for it. Just a word of caution that I’ve also received about jumping to get to your pull up…be very careful! It’s really easy to pinch a nerve in your neck doing it that way. It’s better to find a way to be level with the bar (;like from standing on a bench or something) rather than jumping up. Thank you! I didn’t think of that so I am definitely going to avoid jumping now – a pinched nerve is not something I want to deal with at this point in training! Thank you! 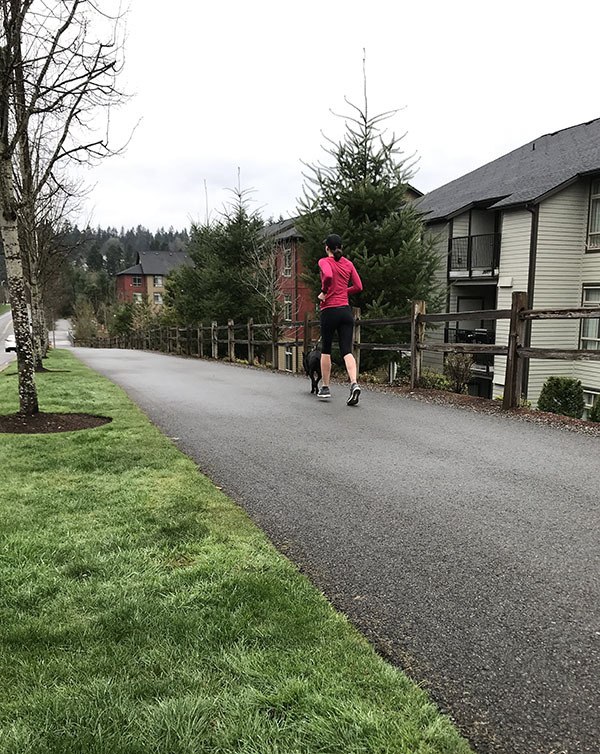 You should do a race once the weather is nice – your training has been very consistent lately! What an exciting time for you – both as a coach and runner! I wish we would start getting some of your weather. We’re still recovering for yet another round of snow!! Thank you! I hope some spring weather arrives your way soon! Week after week you are killing it, Laura! Super exciting to surprise yourself with such strong paces in your 3×2 workout- and what a great progression run, too! I like the HS waffle idea… I’m trying lots of things this cycle and because my stomach was ‘off’ for a month or two, nothing really worked. Now that it’s finally feeling better I’m crossing my fingers and hoping for the best on race day! I hope your stomach is better on race day! I started using the waffles and a performance designed electrolyte drink like Nuun (or Skratch) after reading ROAR. It’s made a huge difference! I would have thought eating whole foods would have upset my stomach more on runs, but now I wonder if the frequent feeling of an off stomach and not wanting to eat after long runs was due to gels. Good luck at Boston! I’ve been craving the oatmeal that you recently shared and have been making it multiple times per week. I didn’t race this week, but might enter a race last-minute at the end of the month…. I am in training, so I’ll see how I feel. I am glad to hear you are enjoying the oatmeal! Good luck on your training, especially if you do decide to race this month! I actually would have run that 10k race had they not said snow, and then it didn’t snow lol. maybe I will get a race in this spring. maybe! those waffles look so good! Thank you! They’re whole wheat sourdough waffles – I use a recipe from King Arthur flour. Nice week of training. Sounds like you’ve got a good handle on what triggers your GI symptoms! I too have those issues and I’ve been managing them pretty well–until last week when I had to take antibiotics for a tooth issue. I’m hoping that the issues resolve quickly! Thank you! Having those adhesions removed certainly helped, but it’s amazing the difference changing my fuel made as well. I hope your GI issues resolve quickly! I love Honey Stinger waffles before runs, but I’ve never tried them during. Not sure the weather is ready for me to race – I have a trail race this weekend that’s looking like it will be super muddy/slushy. It was enjoying them so much as a pre-run snack that made me start eating them during runs, especially after I lost all taste for GU after my recent marathon. I hope your race this weekend goes well – good luck and have fun! You had a fantastic week! I am envious of your dog runs – it just seems like it would be a lot more fun to run with a dog! I had a couple of runs the past few days where I had GI issues…I know I need to keep an eye on what I’m eating since normally I don’t have those problems. Thank you! Running alone is a lot more fun with a dog. When we wanted a second dog, we looked for a breed that could handle longer distance running. Rescuing in particular is worked out well, since mixed breeds are less prone to hip or joint issues than some larger pure breeds. Reading about your strength training goals reminds me that I have skipped too many sessions and need to get back to it. Today will be that day!